The first pack in game for the SegaCD model 2. The first FMV title from Digital Pictures. A sleeper hit if you ask me. And one of the only SegaCD games I have ever finished. 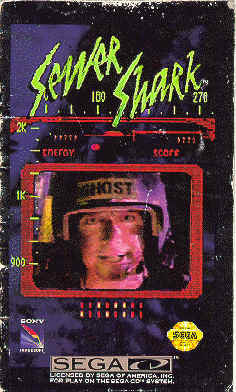 Instructions for Sewer Shark on the SegaCD system. To eradicate the various sewer-dwellers you'll encounter, aim the Targeting Crosshair over the little puke and fire. A BUTTON to fire your Gatling Gun. Catfish is running recon for you ahead of the Hole Hawg. He's locating potential targets for you, and opening the sewer System's flow-hatch doors in your path. At your rate of speed, you don't want to ride into a Tube where the hatch-door is closed-or it will be the last Tube you ride. Catfish will signal you on the com line and give you navigational directions to target locations. Catfish will let you know the path where he's opened the hatch doors by calling out clock face directions Twelve, Three, Six and Niner. His directions are the Tube Jumps you need to make to follow him. Catfish's directions will require you to make three consecutive tube Jumps. For example, he'll call Out: ''Three, Niner, Six.'' You must then take Tube Jumps at the three intersections immediately following his directions first RIGHT (Three), then LEFT (Niner), then DOWN (Six). B BUTTON to activate Steering, then D PAD LEFT when you See the LEFT Arrow on the Tube Jump Indicator flashing. You know a turn is locked-in when the arrow turns yellow. If you do not follow Catfish's directions exactly, he'll try his best to find you and open hatch doors ahead of your new course but he won't always make it... and neither will you. A flashing green light means you have an option to jump to another tube-you don't have to take it. TO make a Tube Jump, you'll need to engage the Hole Hawg's Steering Controls, then Steer into the Tube you want. lf, following a jump, the lights change to yellow, your jump is locked. If that light turns red, you've made the wrong turn or missed the correct turn. The recharge station is just a left or right jump depending which side is green. When the hydrogen level ( line indicator ) gets red hit your C button to fire a flare. OK let me add my personal thoughts on how to beat this game. First, try to memorize the tube pattern and where the enemy critters show up on the walls. They repeat. Do NOT waste energy firing without hitting enemies. You need to have a certain score and energy level to move on to the higher levels. Concentrate on Catfish's tube jump directions and follow them exactly. Lock jumps in as early as possible. Pick off wall crawlers first and follow up with the flying critters. Try not to waste shots on the flying things. After a while you can see their pattern also. The bats and ratigators do not hurt your ship. Everything else will damage you if you don't shoot it. Drop everything to hit the scorpions because the drain energy. And they take two hits to kill. It took me about 4 weeks of on and off playing to get to the end. The story line reminded me of the running man movie. But replay value is low. I don't think I have played the game since.